197 out of 200. No problems with the gun, that’s for sure. Photo by Frank Winn. Notice, however, we didn’t say “the infomercial from hell.” That’s because everything that comes to mind from our sojourn in the high desert is a good thing. Even our repression of the memories of way-too-clearly-evident shortcomings is proceeding nicely. One of those (very) good things was our Academy-supplied pistol for the week. 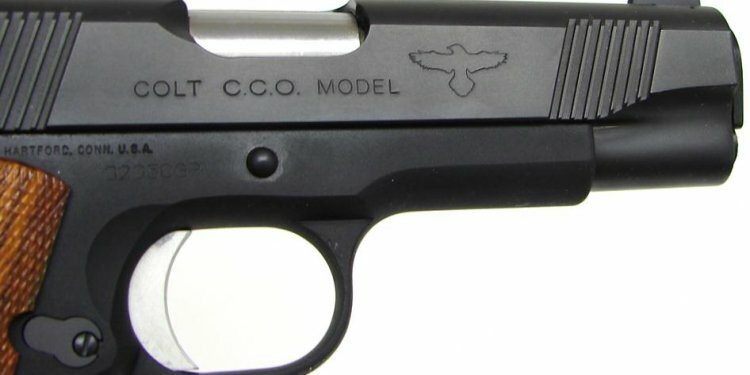 It seemed only historically concordant to shoot a 1911 for the “250” course, given the Heavy-Duty pistol component of the Modern Technique. There are probably only about three people on the planet who don’t know what this means in the lexicon of Col. Jeff Cooper and Gunsite—some variation on John Browning’s icon. This was its own joke, in retrospect. One of the things certainly (and wisely, in our view) not going on at Gunsite is a perverse, almost slavish insistence on the 1911 as the only suitable handgun. Indeed, we found ourselves the only 1911 operator in our class. Figures. When we broached our plan to COO Ken Campbell and Marketing Director Jane Anne Shimizu, we think we were polite but emphatic: We wanted to test the Gunsite 1911 incarnation as any other shooter might—if a personal gun is unavailable or fails, and a backup is needed. It was evident from the outset that they took us at our word, because what we “drew” at the smithy was anything but a shiny shill. Gunsite-specific features move on from there, and establish the bona fides of an essentially custom gun, including Smith & Alexander palm-swelled grip/beavertail safety, Novak sights, Wilson extended slide lock, flat mainspring housing and Chip McCormick hammer/sear combo. The pistol is dehorned all around as well, and has the improved Series 80-ish angled front and rear cocking serrations. The promised 4- to 4.5-pound press felt like it was on the low end of that range to us, though the weight was all but immaterial because the “break” was so good. We expect to struggle a bit with any unfamiliar lockwork, but had no issues whatever. Another touch we’ve come to prefer was also standard on the big Gunsite Colt—thin grip panels. Ours were the standard polished rosewood. Finish on the Gunsite stainless gun is our all-time favorite, too: Colt’s matte, brushed. If it was our pistol, the old peepers would be grateful for a fiber-optic front sight, but we get that this is a highly personal preference. Another Smith & Alexander component would also get added in a hurry—a Slim Line mag guide. In this 40th anniversary year at Gunsite, it’s hard to think of a better time to get to the Academy, especially if you’ve never been. As we mentioned, it’s no longer the all-but-exclusive realm of the 1911, and our class alone contained at least one sample from practically every manufacturer. We’d argue that’s a good thing. When Col. Cooper developed the Combat Triad in the 1970s, it was easy to assert that 1911s were the only handgun that met his criteria for reliability, accuracy and stopping power. Now, both firearms and bullet architecture are vastly better, and many combinations fill the bill.